Mea culpa, mea culpa, I am terribly remiss is reviewing this excellent book. I simply can't do it justice. My French is even more limited than my time. Nevertheless, I've picked up Energie Eolienne Principes et Etudes de cas several times and have thoroughly enjoyed their historical review of French wind development from the pioneering days. Both Marc Rapin and Jean-Marc Noël are pioneers themselves, but the pioneering days I am referring to are the days of Neyrpic and BEST, the days when France was a leader in wind energy technology. Yes, there was a time when France was at the vanguard of wind technology development. Though the book is replete with what you would expect of a modern technical book on wind power, formulas on loads and bending stresses, it is the historical perspective that I find so useful. Lots of wind books include an obligatory section on the modern history of wind energy. Few provide a expansive historical review. There was Volta Torrey's Wind Catchers in the 1970s, professor Désiré Gouriérés in the early 1980s, Jen Peter Molly in the late 1980s, and of course Robert Gasch's series. Cleary, there have been few that have chronicled in detail French contributions. Energie Eolienne Principes et Etudes de cas makes up for this absence. The appendix includes an extensive chronology of wind development in France. This section doesn't start with traditional windmills as you'd might expect. That's not necessary, France has its own famed historian of windmills who has published numerous tomes on the subject. No Energie Eolienne Principes et Etudes de cas begins with the earliest known multiblade farm windmills, some of original French design, and later, some derived from the well known "Chicago" mill. They then carry on to Georges Darrieus and his less well known horizontal axis design of 1929, then to the modern era. Some of the photos and designs have not appeared before and certainly have not appeared in any English-language book. Rapin is an aeroelastic engineer with the French office of aerospace research (ONER, Office national d'études et recherches aérospatiales) and there is naturally a heavy emphasis on aeroelasticity. And though the book jacket and promotional materials simply describe Noël as a "wind energy consultant" that belies his background. He's one of the founding fathers of modern wind energy in France having led Aerowatt for many years early in his carreer. No wind energy library would be truly complete without a copy of Energie Eolienne Principes et Etudes de cas. 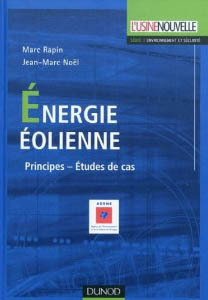 Energie Eolienne Principes et Etudes de cas by Marc Rapin and Jean-Marc Noël, Dunod, France, 2010, 304 pages, 170x240 mm, ISBN : 9782100508013, €59, www.dunod.com. The book is also available electronically. Les moulins " americans "
Et en France . . . ? 10. et pour aller plus loin ?